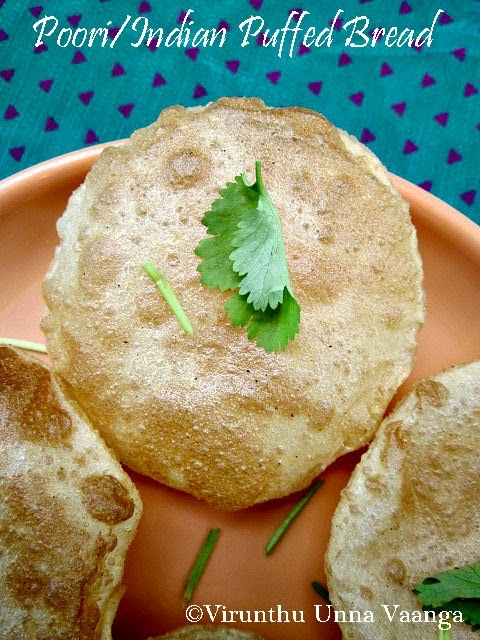 Usually the poori will prepared from whole wheat flour, maida or semolina too… Did you see the road side food shop their puffed poori will always in the puffed condition it never sink and it look like ball shape, right? 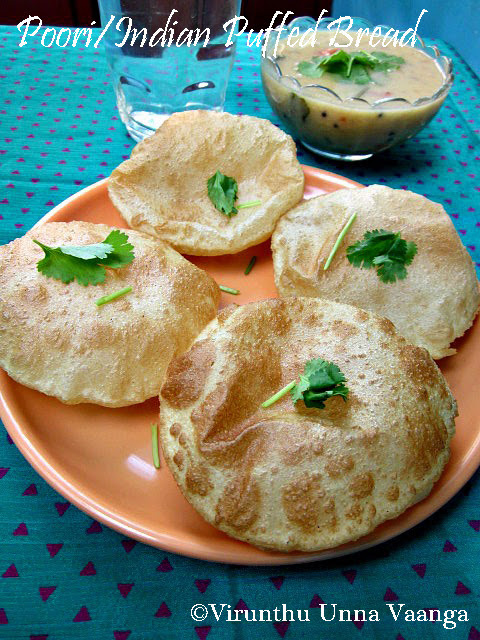 I love that type of poori but it’s not hygienic coz it’s opened in air pollution. 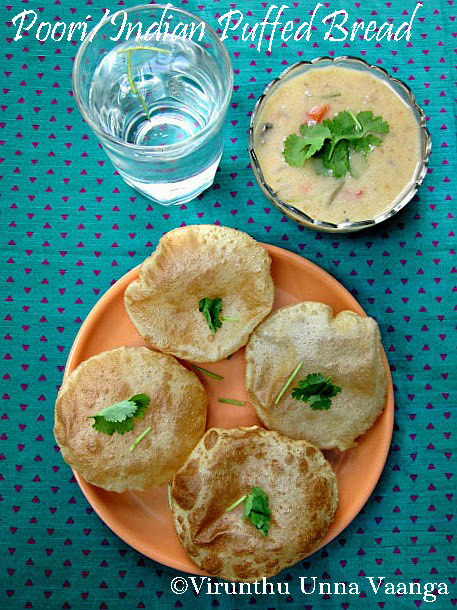 Did you know the secrets of that poori??? The secret ingredient is semolina or rawa or sooji… Yes! That is the main ingredient to hold the puffed texture of poori and it will good taste too. 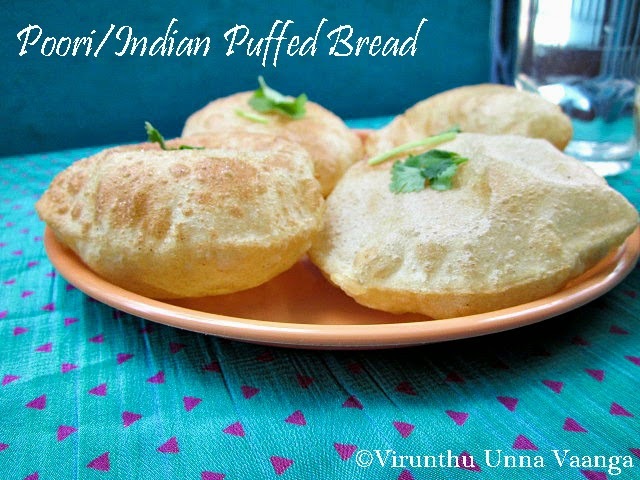 Whenever I feel to have that type of puffed poori, we used to prepare with rawa. 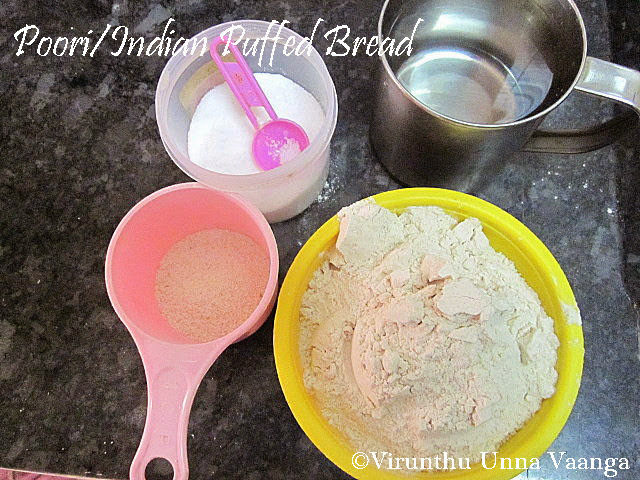 Take a wide bowl add wheat flour, rava and salt mix it well. 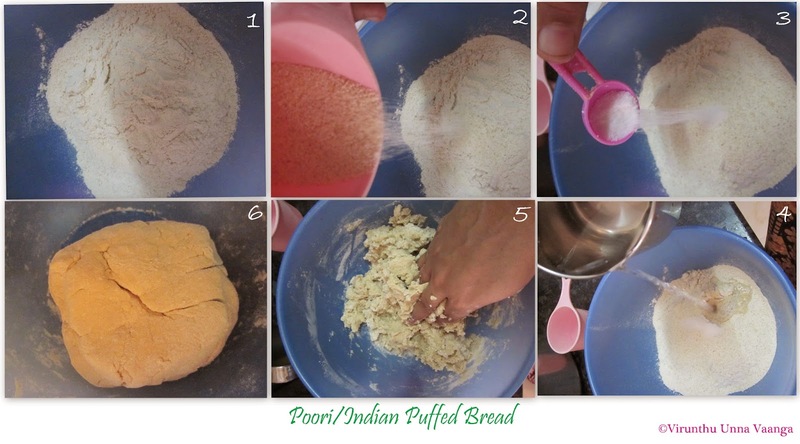 Now make well in the center of the flour and add enough water knead it well into smooth dough. Cover it with kitchen towel and keep it aside for ½-1 hour. Heat enough oil in a heavy bottom pan to deep fry. Knead the dough once and divide into small balls. 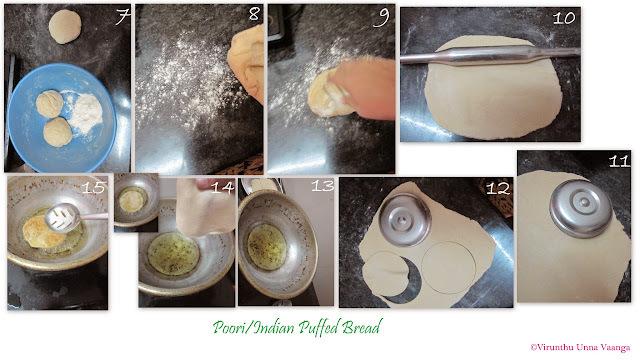 Roll the dough using rolling into small circle or at your desired shape or with cookie cutter. 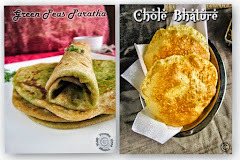 To check if the oil is hot for frying the pooris, drop a small piece of dough into the hot oil, if it sizzles and comes up to the surface immediately, then its right temperature for frying. If the dough becomes dark brown then the oil is too hot and don’t over heat the oil till smoking point. Now put the rolled dough into the oil and deep fry it on medium flame till turns golden brown, it will nicely puffed up. Take it from oil and keep it in absorbent paper. 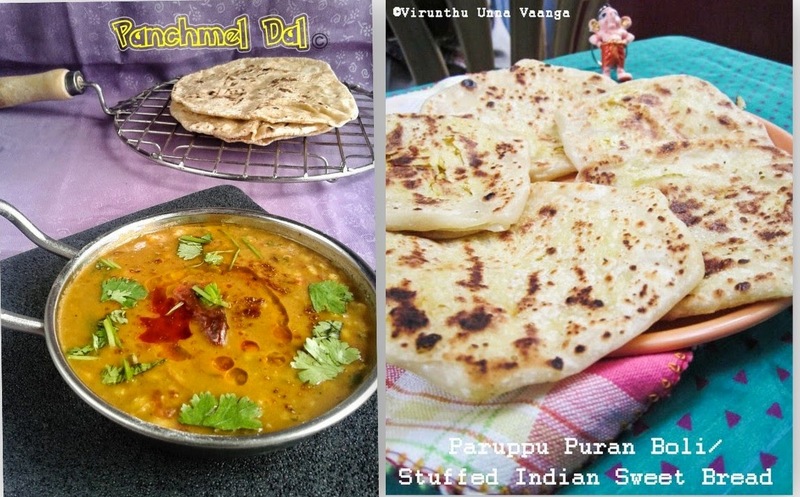 Serve hot pooris with your choice of side dishes. 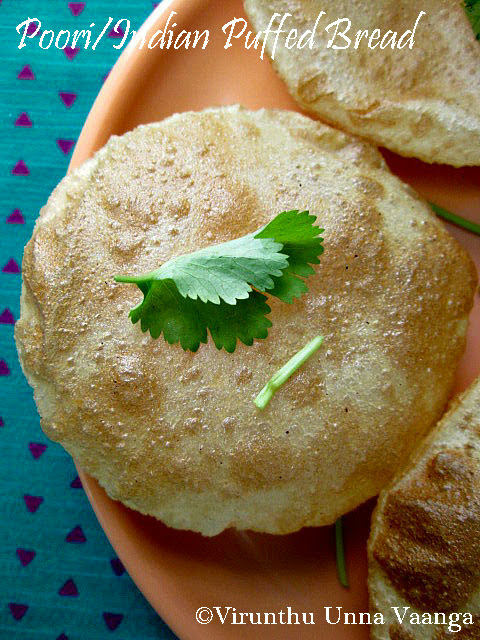 HOT AND CRISPY POORI IS READY!!! 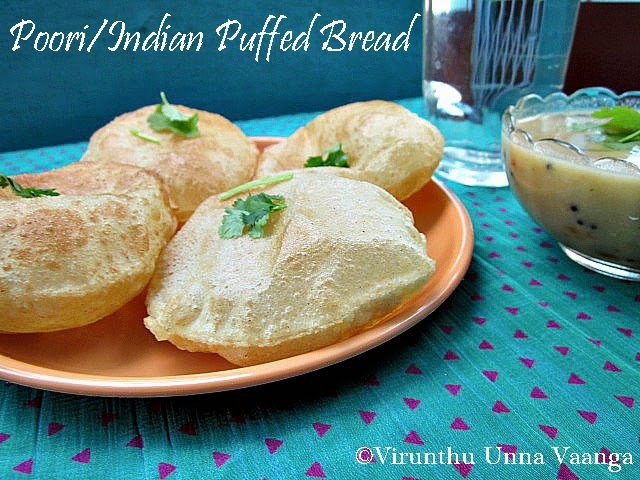 Well puffed Puris :) Hope you enjoyed making and eating it!! Can't resist myself by seeing those puffed poories. Wonderfully made dear.